My Review: Modus Anomali is a strong entry into Indonesian horror cinema. Joko Anwar’s (The Forbidden Door, Dead Time:Kala) 4th movie has a simple but efficient pitch that maintains the tension high throughout the whole movie. By keeping the camera very close to him, Anwar creates a suffocating feeling making us as lost and wary of the surroundings as his main character. While some of the scenes in the forest tend to be a bit on the lengthy side, as soon as something is happening, we are right back in the middle of the action. On the negative side of things, I wasn’t a big fan of the use of english throughout the film since this is not the actors first language. Why make such a decision, especially since there aren’t that many lines in the film anyway. 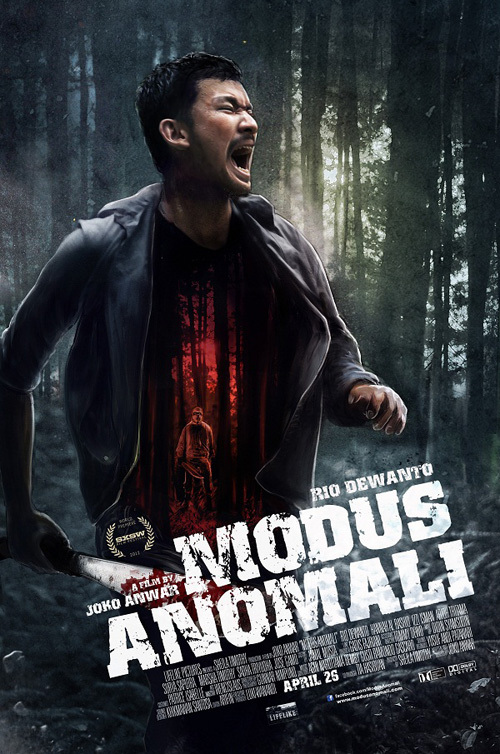 The violence in Modus Anomali is raw and sometimes unexpected with the right amount of gory effects while the mystery surrounding the killer(s) in the woods offers a satisfying conclusion. The last reel actually kept me on the edge of my feet. Once again Joko Anwar is proving that he is a director to definitively keep an eye on and, together with the Mo Brothers (Macabre, Killers) and Gareth Evans (The Raid:Redemption) belongs to an exciting new wave of young directors out of Indonesia..